The complexity of modern healthcare demands that we practice in teams in order to provide high-quality and cost-effective care. Consequently, no matter what their practice site, clinical teachers are more and more likely to intersect with learners from professions other than their own. Clinical teachers must prepare learners from all professions to practice collaboratively. But most physicians haven’t had explicit training in team-based care, leaving many of us uncomfortable with teaching a group of interprofessional learners. 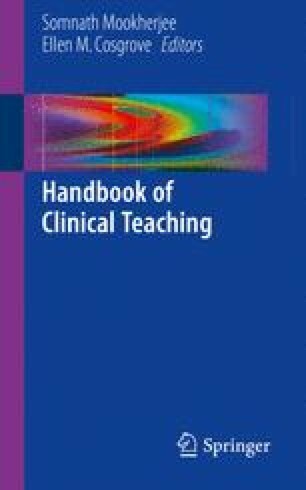 This chapter provides strategies for optimizing team-based teaching in settings where trainees in multiple professions work and learn together. Mitchell P, Wynia M, Golden R, McNellis B, Okun S, Webb CE, Rohrbach V, Von Kohorn I. Core principles & values of effective team-based health care. Discussion Paper. Washington: Institute of Medicine; 2012. www.iom.edu/tbc.